Which comes first: the music or the words? Orlando Chamber Choir’s summer workshop explores this question in a day of choral music by Claudio Monteverdi. In his Fifth Book of Madrigals Monteverdi distinguishes two musical streams: the prima prattica, in which the music underlines the text, and the seconda prattica, in which the text determines the musical lines. 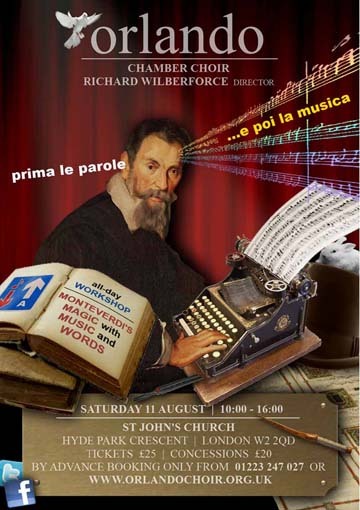 The workshop will show how his development from prima to seconda prattica resulted in an increased vividness of musical drama and emotion, eventually driving 17th century composition from late Renaissance to early baroque. Prima le Parole is open to all choral singers but sight-reading skills are a prerequisite. Tickets are available by advance booking only.